Both sleep apnea and snoring are closely related breathing disorders; the former being a more fatal complication than the latter. Though both stem from congestion in the air ways during sleep, snoring does not affect the quality of sleep whereas sleep apnea can not only be dangerous to one’s well being but it also affects our comfort levels during our sleep. Poor quality of sleep directly results in fatigue and sleepiness during the day. These symptoms are not evident when dealing with snoring but with sleep apnea we find them clearly present. Once these symptoms are detected or suspected, one must directly avail its medical treatment services. Before resolving sleep apnea disorder one needs to know which type they suffer from. Sleep Apnea is of three kinds; Obstructive Sleep Apnea (caused by increased relaxation of the soft oral tissues), Central Sleep Apnea (caused by imbalanced respiratory controls of the mind) and Complex Sleep Apnea (which is a mixture of the two aforementioned types). Once the type of sleep apnea is identified, you can start working on its resolution. 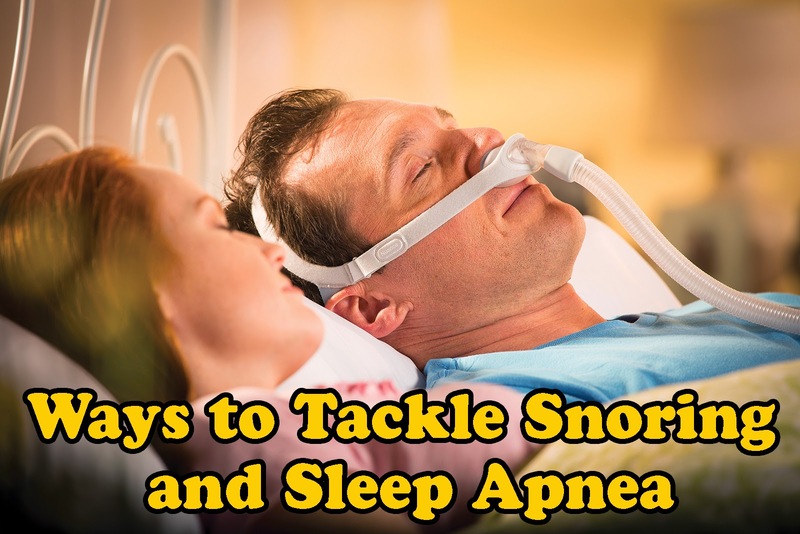 Tackling sleep apnea and snoring can be done in a number of ways. Some lifestyle changes can be beneficial in producing favorable results. Availing the services of oral dental appliances also help solve either of the problems. CPAP alternatives to sleep apnea remedies can also prove to be a good resolution to these breathing disorders. Finally, if nothing else works or the situation is beyond critical, surgery is suggested. The most popular of snoring remedies include incurring some lifestyle changes such as losing one’s weight, clearing one’s nasal passage with something like Neti pot or any other such decongestant, giving up smoking, establishing a regular sleeping pattern, moistening one’s bedroom air and/or repositioning one’s posture while sleeping as in elevating your head by four inches assists your tongue and jaw to move forward and avoid any congestion whatsoever. The sleep apnea remedies present in the medical world today usually deal with OSA (Obstructive Sleep Apnea). Lifestyle change that help tackle sleep apnea are same as those used for snoring. Apart from such self help, one can also use mouthpieces or oral appliances. A dentist or an orthodontist can provide you with a pair of custom made mouthpiece that prevent your soft oral tissues from collapsing or constricting the air passage. But the gold standard treatment for moderate to severe OSA is the use of CPAP (Continuous Positive Airflow Pressure). The treatment helps you with your breathing problems by providing a constant flow of air while you sleep. Many patients have complained about the devices but everyday new advanced features are added to it and today the entire device is the size of a tissue box and much more lighter, quieter and portably comfortable. Surgery is the last resort when people are not able get any relief whatsoever by the aforementioned remedies. During such surgical procedures, the excess tissues in the mouth and the throat are stiffened or made to shrink.